Wednesday 10th December - YASI Overlays sold out! All YASI overlays have now been sold! For 2015, I am thinking to do a re-run of the Mine Storm overlays. I first released these in 2011, and they were exact replicas of the original overlays. The only difference was the small and discrete copyright text which said reproduction. Please drop me an email (sales@vectrex.co.uk) if you would like to be added to the "I'm interested list". Sunday 9th November - World's smallest Vectrex! Richard H, noted hardware homebrewer and famous in the Vectrex world for his various Vectrex flash and multicarts has been teaching himself CAD and the art of 3D printing. Richard has recently produced a 3D printed Vectrex key ring and just shown pictures on Atariage.com. Richard says "that it was pretty easy to design and print the Vectrex because its just a big cube. The Mine Storm screen decal was printed on a thermal label printer." I’ve "borrowed" his pictures and presented here - I just had to share this awesome concept! Note to self - got to request one of these on my Christmas list. To celebrate IPYVD 2014 here I play home brewer Alex Hubert's 2003 YASI game for the Vectrex. I play the game in conjunction with the VecVox, and one of my YASI overlays. Dimming the lights give the illusion of colour graphics - just like the original Space Invaders. YASI was one of the first games on the Vectrex to feature raster type graphics. Vector purists will say featuring raster type graphics on the Vectrex is blasphemy. However, the technical feat of displaying raster graphics on a Vector machine is something to be marvelled. Very soon this game will be available to purchase on cartridge again from new Vectrex game distributor Packrat Video Games. Further to the announcement of the International Play your Vectrex day to be held on 1st November, multicart creator jfmateos has announced on the Vector Gaming Forums the raffle of a MVBD+MVRMC16in1 kit for all this years future participants. This multicart can store up to 16 off 32 kB or up to 8 off 64 kB Vectrex games. It's really easy to use and plugs to your computer through the USB port. It disguises itself as a mass storage device (MSD), so you won't need to install additional software to use it (apart from the USB MSD driver that is already included in most of today´s operating systems, i.e. Windows XP, Windows 7, Windows 8, Mac OS and Ubuntu). To copy a ROM you just have to drag it to the burner drive. Initiated over two years ago by Vector Gaming Forums and Vectrex wiki creator Darryl B., aka VectorX, we reach the third anniversary of International play your Vectrex day. Held on the 1st of November every year, this day is a celebration of our favourite little machine. Participants play their Vectrex and report what games they have played and with the option of giving a score. Non Vectrex owners can participate in the honourable mentions section by submitting some info e.g. the games they played on a Vectrex emulator. 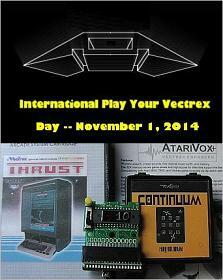 This year, 1st of November is a Saturday, so there’s no excuse, please support this special day celebrating the Vectrex! Let's try and increase the number of participants! More info about the rules/regulations can be found here. The men primarily responsible for creating the Vectrex, Jay Smith and Gerry Karr were in attendance together with Chris Romero at a Vectrex discussion panel meeting held at the Classic Gaming Expo 2014. Despite being scheduled an hour before the CGE regular show schedule open time (9am 13th September) they had a big audience. Jay Smith, often called the father of the Vectrex, repeated many of his previous stories about the Vectrex and his stories were complemented with insights from Gerry who was the hardware engineer behind the Vectrex. Gerry announced a "secret" regarding a missing component in the Vectrex. Chris Romero, modern day Vectrex philanthropist, was also active in the discussion panel, and Vectrex topics old and new were discussed. YouTuber "Noir Magnetique" has kindly uploaded a video taken at the panel meeting and this is highly recommended viewing for any Vectrex fan. Friday 29th August - New Vectrex wraps! Michele Fiori, previous producer of the Protector, YASI and Scramble wraps which cover the Vectrex in arcade like graphics is at it again! This time he has been busy with producing wraps for the games Berzerk , Vectrexians and Vector Pilot - And they look really beautiful! Fiori has just announced that the order list is open. 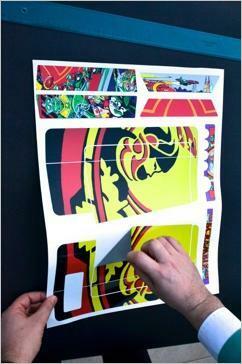 First he’s printing a limitd edition run of just 30 wraps for each game. Full information about the wraps and his contact details can be found on the news page of his website. After a brief hiatus following work and holidays I can finally return to all things Vectrex. Catching up with news in the Vectrex world, the YouTube video posted by Robert Paradiso early this month is of interest. He built a wireless controller prototype for the Vectrex and demonstrates the prototype in his video. For this implementation he uses modern electronics comprising two Arduino microcontrollers and XBee for the wireless communication. The controller works in digital mode, so of course not all games can be played with this controller. However, for the test he made with the controller for Mine Storm he reports he was able "to play a few feet away and it felt very responsive." More technical information can be found on his website. Blimey - nearly got to the end of May without making a news entry! It’s been an extremely busy month what with closing big projects at work, and preparing and sending YASI overlays during th evening and weekends. I have sold out all my 100% perfect overlays now, and just have a few "seconds" left which have some visible marks on them when studied carefully. Place them on a Vectrex though and you won’t notice. As these are not perfect I’m selling these for a reduced amount. If interested just send me an email. The high scores page has been updated to include all the new scores I’ve received so far this year. Olivier Orillard has achieved a first! With the score of 56,250 he is the first to register a high score for Mail Plane. And although Olivier currently holds the highest score for Vector Pilot (normal mode) with 203,800, only a couple of days ago, there was another first:- Centaura submitted a humongous score of 935,500 in the hard mode of Vector Pilot. Is it conceivable to think that a higher score is achievable? Finally, I’ve taken the opportunity to update the software links pages to link to the sites of the new home brewers. Keep an eye on these links in case there is a new game file to download or cartridge release announcement. Monday 14th April - YASI Overlays manufactured! 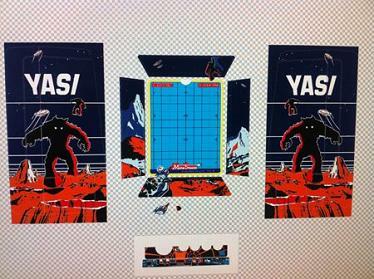 The YASI overlays are finally ready and I hope to pick them up from the screen printers this week. If they look ok, and once I have worked out postage, then I'll be sending an email out to all those on the "interested" list. Sunday 13th April - New demoscene demo "Very Vectight"
Pex "Mahoney" Tufvesson, normally active in the Commodore 64 demoscene wrote a demo program for the Vectrex and entered it to the "Gubbahelg i Lund II - Isterparty 2014" release party held in Sweden on 11 - 13 April 2014. During the release party, the demo was ranked first in the combined demo competition! At just over 10KB, the demo uses a combination of bitmap graphics (mostly for the scrolling text) and vectors for various line effects, and all accompanied by Chiptune music. The music is actually recycled, and is the music from the original 1985 Commodore 64 game Thrust, and which around 10 years ago was converted to the Vectrex by Ville Krumlinde in his version of the Thrust game. The demo looks much better on an actual Vectrex rather than on the YouTube video shown. You can download the demo binary at www.pouet.net. Added two magazine scans from the 80’s. You can find them under the [Documents] tab and selecting "Magazine Scans". The first scan is of the premier issue of Electronic fun with computers and games from Nov 82. This introduced the US public to the GCE Vectrex and presented mini reviews of the games. The other magazine is Personal Computer World (PCW). The scan is from the August 83 magazine and presents another Vectrex review. PCW was a British publication, and this was the magazine where I first read about the Vectrex when I was a mere school boy. I’ve been spending a couple of years now trying to get hold of this magazine. However, the few times I did see it on eBay I was always outbid. I recently learnt that The Cambridge Centre for Computing History have a full archive of computer magazines including PCW. I dropped them an email and despite being very busy they kindly made me the scan. The museum is open 5 days a week, and with plenty of retro computers. I definitely recommend a visit to them if you are in the neighbourhood. Even Sir Clive Sinclair was there in person a few weeks ago! Exciting times in 2014. I think we are experiencing a Vectrex renaissance! New hardware and new software coming all within the same period. I mentioned a couple of days ago about homebrewer Chris Malcolm and his beta release of HEX. Well, he’s just shown a screen shot of one of his other games in development. Called DEATHCHASE, this game is the Vectrex equivalent of the controversial Death Race arcade game from 1976. Controversial? Yes! -at the time. The game was inspired by the 1975 film Death Race 2000 . The player scores points by manoeuvring a car to run over pedestrians that run around on the road. Dead pedestrians turn into tomb stones which can block the passage of the car and this increases the game challenge. Chris has informed that this game will eventually be released in cartridge form together with another car based game called NOX which has been written by homebrewer James Watt. Last week homebrew author Chris Malcolm (so far known in the Vectrex world for his Nagoya Attack Beta ) released a Vectrex demo called HEX. It uses joystick/buttons or a spinner/Atari driving controller in port 2. (An Atari driving controller can be plugged into the Vectrex without major modification. All you you need to cut away two small areas on the outside of the Atari connector so it can fit into Vectrex socket). To me the game feels feels like a cousin of the original Vectrex game Bedlam, but Chris informs that HEX is also inspired by the cross platform game Super Hexagon. In the game the player's ship is in the centre of repeating shrinking hexagons, and you and it must be rotated to point in the direction of an open exit in order to get to the next hexagon. At the moment the game pattern is fixed but the demo is still very playable. The positive feedback from the Vectrex community for the demo game has prompted Chris to progress the game development further and eventually make a cartridge release. This will include better music and variable patterns and potentially a game overlay (If you have a Vector Pilot overlay this already works very well with the demo!). You can down load the game demo ROM file from the Vector Gaming or AtariAge forums. Sunday 9th March - Fun fun fun on the Autobahn - New Vectrex driving mini game! I'm struggling to keep up with reporting on German home brewer Der Luchs' activities! He's just released another mini game. It's called VECFAHREN and it is a 3D driving game. Like his other mini games, VECFAHREN can be quite unforgiving- you only have one life. Unusually for a Vectrex game this game is accompanied with music during game play. In addition there is VecVox support. Der Luch states that he has finished the game and the ROM file can be downloaded directly from his website: www.luchs-soft.de. Sometimes there is too much Vectrex news to put on this website so I typically just make short summaries. Now and then I make much longer reviews and articles for magazines. However, at this moment I am not actively submitting to any publications. I’ve always wanted to have a go at making a fanzine. This last couple of weeks I found the time to make one! You can download the pdf from here. To cover the first quarter of this year I have repeated but also expanded on some of this website's news items for the fanzine. There are full reviews of Mateo’s burner/dumper and multicart cartridge and Madtronix’s 3D imager. I hope you enjoy. Saturday 22nd February - Mobile game App Flappy Bird arrives on the Vectrex! Although the computing power of a smart phone is considerably more than the first home computers and games console of the 80’s, quite a few phone game Apps (especially those written by a single author rather than a full software house) fit the ethos of the early 8 bit games i.e. simple graphics and addictive game play. So it is not uncommon to see some of the popular games get ported to the computers and games consoles of yesteryear. One such game is Flappy Bird. The idea of the game is to fly a bird through a set of oncoming pipes as they scroll across the screen. Control is simple and requires just one finger. One tap flaps the bird’s wings causing it to fly up. Gravity pulls the bird down. The game was released as a free App for iOS and Android phones in May 2013. Having enjoyed great success this game became infamous when it was discontinued only a couple of weeks ago by the author who cited the reason for doing so was that he was worried about the game’s addictiveness. The game’s removal from the digital stores has spawned many copycat versions both for new and old platforms. Already there was a homebrew version for the Sinclair ZX81 and the Atari 2600. Now there’s a version for Vectrex. Homebrewer Michael Simonds has recently released a free binary download called Veccy Bird for the Vectrex. And although the graphics are of course vector based it’s nevertheless a very faithful version. Veccy Bird is available right now via Dropbox as ROM. ROM file which can be enjoyed in an emulator or on physical Vectrex hardware via a programmable multi-cart or EPROM based cart. This would be a good game to go onto a Vectrex cartridge compendium of one finger controlled games. Is your Vectrex feeling naked? Over at www.vectrexwraps.com, Vectrex wrap producer Michele has announced that the printing work for his new YASI, Protector and Scramble wraps has begun, with shipping expected in March. These wraps will cling to the Vectrex and can be removed many times without any residuce left behind. First off, he is giving those who expressed interest back in 2012 the chance to finalise their order. If you weren’t on that pre-order list (i.e. you didn’t receive an email recently) then best to get in contact with him directly and as soon as possible. He want's confirmation of order by 28th February! Full information about the wraps and his contact details can be found on the news page of his website. Interestingly, Michele has announced that every two/three months he aims to release new wraps dedicated to the new and old vectrex games. The next one scheduled by May 2014 will be for Berzerk. Prices start of at 20 Euros for one overlay plus postage and packing. At the end of last year I contracted a local screen printer to print a batch of YASI overlays. After a lot of back and forth communication regarding the final art work and testing of different glaze samples I have finally signed off the proof with the printers. The image on the right shows previous work in progress regarding glaze sample colours. For me it was important that if the surrounding lights were dimmed, the graphics on the Vectrex screen appeared to be in colour with the graphics having the same colour hue as the original Space Invaders (which also used colour overlays to give the impression of colour). The printers have informed me that they hope to manufacture before the end of this month. This means that all going well I can start shipping the overlays in March. As soon as I have the overlays in my hands I’ll be contacting everyone who emailed me, to inform them of the final price and to invite them to pay if they want to purchase. 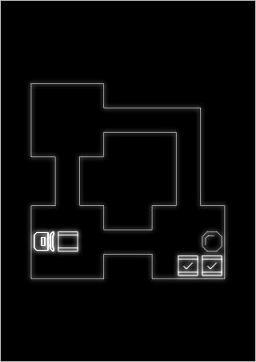 A new puzzle game/demo binary for the Vectrex has been recently made available to the public, though it’s been around since September last year when the game was created for the Coding Compo at the DoReCo-Party 2013, Germany. Called P1X3L-pushr and written by Alex Kazik with graphics by Retrofan, it’s a game based on the same game they had written for the Commodore 64. The game shows a birds eye view of a floor plan. You must move your player around the floor and push boxes into target areas. When the player is moving forward, the boxes can be pushed, the goal is to move all boxes to the target areas. There are six floors to complete. At 2K the game is very much a demo and as such lacks sound and after completing all six floors there is nothing further to do. The game can be downloaded here. For budding game developers not only is the ROM file included but also the full source assembler code. Astute readers of this website will know I’m plodding along with building my full size Vectrex arcade cabinet and you can see intermittent progress updates on my VecCab blog. A far quicker cabinet builder is Minwah of the ukVAC.com forum. He has been very speedy in the building of his Vectrex Cocktail cabinet! (and he has built it from scratch). He started in the summer of last year and in late December published photos of the completed cabinet on the ukVAC.com forum. "The cabinet is constructed from 18mm MDF, laminated with Formica laminate (matt black and walnut). The only exception is the table top, which is 12mm MDF, with 6mm MDF on top (at the front and back), and 6mm toughened, tinted glass in the middle, to form ~18mm thickness overall. The 12mm MDF is laminated black so that it looks good through the glass. I have used 3/4" textured t-molding to finish the edges. Inside, the Vectrex remains in its case and is set into a shelf, facing upwards. The front (screen) of the Vectrex is as close to the glass as possible, without de-casing the Vectrex (which I did not want to do). Each side of the cabinet has a handle hole, so the machine can be easily lifted and moved around. One of the handle holes doubles as a cartridge port - which is extended from the port on the Vectrex with a male edge connector / ribbon cable / female edge connector. The controls are a Sanwa J-Stik (JLW) joystick, and Gold Leaf buttons from Ultimarc. 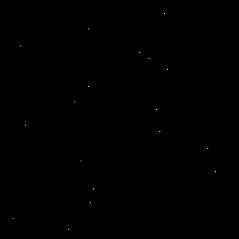 These are interfaced via a small simple circuit to the Vectrex controller port. I cut a cheap PC serial cable in half and modified the plug to fit. The table top is hinged and can be easily lifted up (once the front lock is unlocked), which can allow changing of overlays, or access to the volume knob. There is a mains power switch on the rear of the cabinet, which I tend to use and leave the Vectrex power switch on. There is a reset button on the front of the cabinet, which requires a slight modification to the Vectrex - ie a pair of wires extending from the internal reset button." Saturday 4th January - Happy New Year ! Another year has gone and the Vectrex remains an enjoyable pastime for many. This includes collecting, developing and actually playing it! Looking back over the last year the biggest positive event must have been the release of the Mail Plane game binary to the public. This GCE/MB unreleased game had previously languished in private collectors hands for many years. Thanks to Chris Romero (aka Vectrexer), and a few other generous financial backers, the game is now available for anyone to download and play on their Vectrex. Despite the positives for 2013 there were some negatives too. The biggest negative was to see John Dondzila’s announcement in 2013 that he would no longer be producing cartridges for the Vectrex. Prior to that announcement one could have purchased any of John’s great games or any specified game binary at a very reasonable price. The hope remains that another person can provide this service. The expected 2013 release of Warrior by Fury including a professionally made box and overlay had everything for a Vectrex fan to salivate over. Unfortunately for most they did not receive their purchase. Fury has explained that he experienced some production problems with his suppliers, including issues with the quality of the overlay. Fury has now found another overlay supplier and has now promised early 2014 shipping of the game. I know the potential issues that can arise with screen printed overlays. A couple years back I got a local screen printer to produce Mine Storm and Pole Position overlays. It’s very hard to achieve the quality of the originals but it can be done even if they have to be reprinted as was the case for the Pole Position overlay. That experience did not sour my desire for making new overlays. 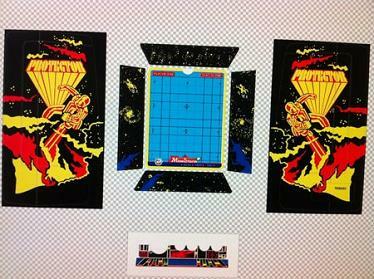 The end of last year I sought the interest of Vectrex owners for a new overlay for the Space Invaders game YASI. Thankfully there was enough interest to warrant me to put a down-payment for the production of 50 such overlays. This is work in progress, but I hope in the next weeks to report on the progress. Future Vectrex activity in 2014 looks to be promising. In the last year there have appeared new home brewers to the scene and going on the demos that have already been shown there is much potential for new games. From the already established home brewers there is also great anticipation. Will 2014 be the year for the release of Kristof’s Vector Patrol? In addition to Warrior, Fury also has some other games scheduled for release in 2014. Fury also launched a new quarterly magazine called Vectorbolt for Vector Game enthusiasts, with the first issue due this month. And what of me and my activities? Well, apart from the YASI overlays that I already mentioned, I’m still tinkering with new ideas for the Vectrex. Last year I modified a cheap controller for use with the Vectrex and in the next months I want to give details on how it was done. I’m also still plodding along with the development of my VecCab. I’m hoping that this year that at least the hardware side can be finished and than I can work on the software side. Of course this all depends on my real life work load. Finally, thank you to all those that have given feedback on my website and to those who I've had many email discussions with concerning the Vectrex. This website is now in its seventh year! I do have Google analytics for this site and the number of visitor hits reported for the last year was again over 11,000 visits which is quite a respectable number considering the Vectrex is believed to have a relatively small fan base. The aim of vectrex.co.uk is to help keep the Vectrex alive by generating interest in it. If you have any news relating to the Vectrex that you think would be of interest to other Vectrex fans I would gladly present it here in this news blog. Also if you have a new high score just let me know. 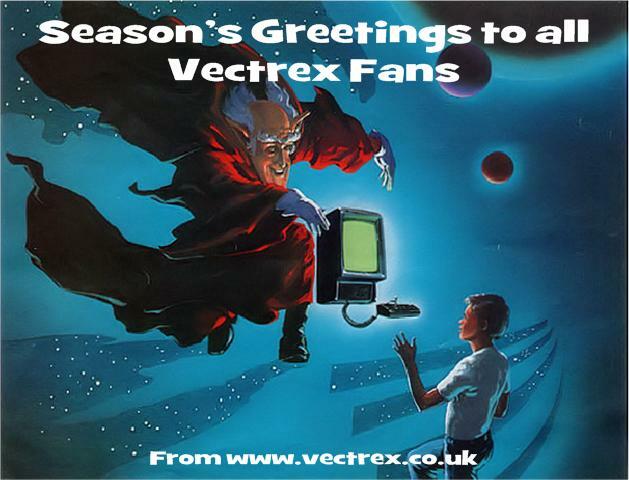 Happy new year to all Vectrex fans!